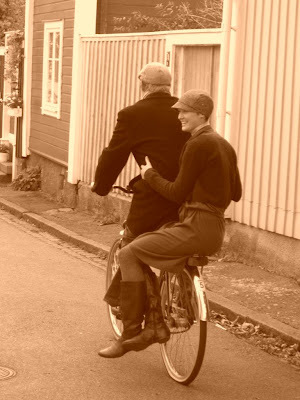 I just had to get this photo up, sent in by Derm in Scotland, from a trip he made to Copenhagen last year. A beautiful shot of his two friends. Cracking style, cracking mood. A lovely cloche hat on her and a smart sixpence on him. Not to mention all the rest of their garments. Bet she feels like a pillionaire! I like the brown tone of the shot. It does have that classic look to it with or without.